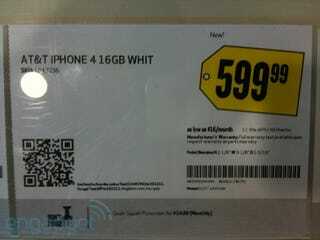 First it was there and then it was gone: The mysterious white iPhone 4, seemingly as rare as a completed Green Bay Packers 2nd half pass, was spotted in placard form at a Houston Best Buy. The link has long since been taken down, but the images remain, courtesy a tipster over at Engadget. Price? To borrow an Apple marketing trick, "just" $599.99 off contract. The white version is all but confirmed to be launching within the next few weeks, but it still has to be comforting to white iPhone lovers to see the big box chains confirming it even more with their placeholders and shelf info cards.